A thick cloud of cosmic and violin breezes, pulsatory boom-boom, floating orchestrations and sequences which dance lightly all around the compulsive bludgeoning of the bass percussions/pulsations, "Analog Tape" makes our eardrums quivering with a lively and heavy rhythm decorated with more melodious sequences of which the singings croon through cosmic elements. The rhythm takes a break, giving so the chance to our ears to hear a little more this range of cosmic tones, before taking back this rhythmic road which will make buzz our hearing. Heavy rhythms, pulsatory and resonant basses which accept nice catchy melodies in rather cosmic ambiences, the music of Wellenfeld has not aged since The Big Bang, the last opus I heard from them in 2011. I had certainly heard bits of Pandemic in 2013, and I had found that Detlef Dominiczak and Andreas Braun gave a solid orchestral direction to their music. It's pretty much the opposite here. With a solid blend of ERM (Electronic Rock Music) and IDM, Wellenfeld is more resolved than ever to walk in the paths of Pyramid Peak. Our quest to the discovery of the small jewels in “Elements” goes on with "Ring Modular". This time, Wellenfeld leads us towards its sumptuous electronic ballads with a good morphic down-tempo filled up with cosmic effects and adorned with these sequences, as hypnotic as harmonious, which switch the roles in discreet corridors where a beautiful piano lies down the mirages of its solitude. And what would be a good ballad without effects and orchestrations which rip the heart, the soul? "Ring Modular" proposes this with beautiful impetus of intensity. It's a beautiful cosmic ballad in the purest tradition of the New Berlin School style. The same goes for "Vintage Attack" which seduces with its numerous strands of sequences which spin all around and through a slow and pulsatory rhythm. The effect of dense orchestrations which wrap and slow down the rhythm in our ear, as well as these futuristic Vangelis synth layers, are beautiful effects of seduction. The melody is also of a very intuitive kind. The swirling sequences which awake the frail atmospheres of "Human Elements" propel the rhythm towards a kind of trance ideal for a hot and humid dance floor. The sequences hiccup and cackle, so giving all the latitude to the technoïd percussions and to the funky bass line to catch up this structure of rhythm which collides the Trance Wall, we stay all the same in the lunar domain, a little after the 3rd minute. "Timeless Gravitation" is more ambiospherical. And as each track of “Elements” possesses enough minutes to the meter in order to modify either the course or the intensity, "Timeless Gravitation" brings its beautiful orchestrations and its layers voices, hardly perceptible, towards a very lunar slow dance-tempo. I hear Software here. "Noize Modular" is as much creative and ear-catching as "Analog Tape". The meshing of sequences, percussions and bass pulsations, one of the key element in “Elements”, is however clearly more elaborated here. It's one of the best track in this Wellenfeld's last album. But the palm of the best track goes doubtless to "Dark Sphere". The envelope is sewn of mystery and of nebulosity with a good movement of crystal clear tones sequences, as well as the sequenced chirpings, which encircles an exciting rhythm. A slow rhythm which, at times, gives the impression of taking the shape of a techno-lunar phase (we even hear rather suggestive bangings of hands). The atmospheres here are superb and the sequences knotted in intertwining moves, as rhythmic as harmonious, and of which the charms are constantly rotating the measure of the paces, here as everywhere in “Elements”, impose a whole dimension to "Dark Sphere". Simply a great track! "Black Out" and "Sin Wave Machine", which is clearly more furiously danceable, lead us in the dance-music corridors of “Elements”. This is dance music polished up to the bone by very good movements of sequences. "Day of Silence" offers another heavy structure of rhythm knotted around circular sequences which grab onto some strong bass pulsations and on percussions allied of metallic tsitt-tsitt. More IDM than Electronica, the track offers beautiful harmonious elements which are not far from creating an ear worm. Motivated by these voices of astronauts, that we hear in some places on this last opus of Wellenfeld, and arched on a mid-tempo wrapped up with suave orchestrations and with layers of seraphic voices, the pulsatory rhythm of "Time Traveller" also hosts these structures of melodies drawn by arpeggios which hesitate to fall, preferring to flutter and to roam in the ambient air. 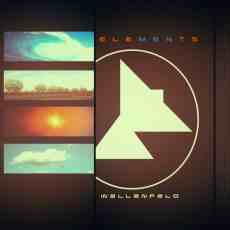 It's a track which is just as the image of “Elements”, another nice album of EM released by MellowJet Records. In fact “Elements” is an album as much melodious as the diversity of its structures of rhythms which seduce by this intelligent twinning of sequences, percussions, bass pulsations and bass lines which are in the purest tradition of Wellenfeld music. And why change a recipe when it is as well tasty as inspiring? I don't say that the music of Wellenfeld goes round in circles. Not at all! Detlef Dominiczak and Andreas Braun have this art to freshen up style with just what is needed not to distort it. So their boldness is comforting. Yes, a duet which is not really far from Pyramid Peak.